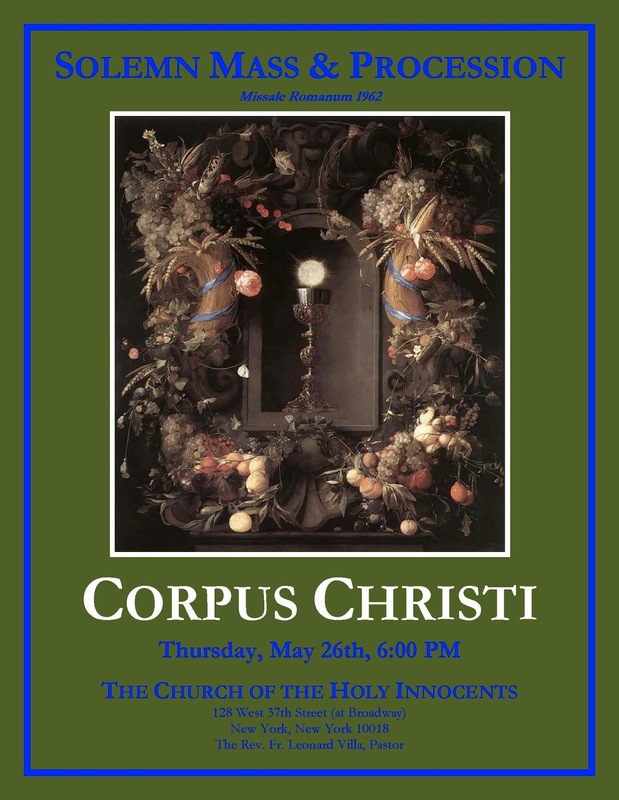 The Church of the Holy Innocents in New York City will hold a Solemn Mass for the Feast of Corpus Christi, followed by an outdoor procession in midtown Manhattan on Thursday, May 26, 2016, starting at 6 p.m. 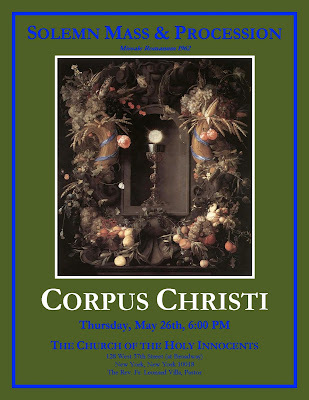 Since 2009, the traditional Mass community at the Church of Holy Innocents has celebrated Corpus Christi on its traditional date — the Thursday after Trinity Sunday — with a Solemn Mass in the Extraordinary Form of the Roman Rite. In 2009, the Mass was the first of a novena of Masses in the Extraordinary Form that concluded with a Pontifical Mass at the Throne for the Feast of the Sacred Heart of Jesus. The inaugural procession with the Blessed Sacrament took place inside the church followed by Solemn Benediction. Since 2010, every procession following the Solemn Mass has been outdoors. In the words of a Holy Innocents parishioner, “It is such a great act of faith to go in procession with the Blessed Sacrament through midtown Manhattan near Macy’s, Herald Square, and Penn Station.” Since 2010, the faithful members of the traditional Mass community at Holy Innocents feel tremendous joy at the occasion to make a very public expression of their Catholic faith in the Most Blessed Sacrament. Before the 6 p.m. Solemn Mass, the parishioners will recite the Holy Rosary at 5:20. The Choirmaster and organist, Mr. Pedro d’Aquino, will direct the music (Messa a tre voci by Saverio Mercadante, 1795-1870). After the Mass and the outdoors procession, there will be a festive reception in the parish hall.